Regardless of what these types of events were — wildfires, earthquakes, floods, typhoons or hurricanes — emergency aid and relief was, and still is, vital to the health and well-being of those affected by these tragedies. This is where humanitarian aid and relief organizations come in to assist. However, in order to call for help, and for these organizations to be able to do what they need to do to serve affected communities in emergency situations, connectivity is vital. Whether it is getting telecommunications back up and running, providing patients in remote regions with access to specialists through video calls, or simply setting up a network for families to reach their relatives to let them know they are safe, connectivity not only helps communities sort through the mess following a disaster, but it also helps them get back to normal life. Establishing or re-establishing connectivity in some of these locations can be difficult due to the remote areas that are often in need of humanitarian aid and disaster relief after a catastrophe. This makes it even more important for organizations to work with a well-established service provider with experience delivering connectivity to remote locations. To provide this type of mission-critical connectivity, ITC Global, a remote communications provider, supports organizations at the forefront of humanitarian aid, including NetHope, a consortium of the world’s leading humanitarian organizations, the Red Cross and that organization’s globally deployed Emergency Response Units (ERUs), Plan International and more. Partners and vendors of the disaster relief and humanitarian aid community must have a keen ability to create flexible solutions, help customers manage logistical and budgetary constraints, and deliver top-tier global support and training to empower aid organizations’ deployed staff. ITC Global doesn’t simply provide communications in response to disaster recovery missions following natural disasters — it provides ongoing support to these aid organizations that do life-saving work every day, and is regularly recognized by these organizations for efforts and continued commitment to improving the human condition across the world. Catastrophes can happen in seconds or minutes and often leave devastating chaos and destruction in their wake. The time following these events is critical, and the time it can take for a communications provider to react and reorganize if a system of solutions isn’t already in place can mean life or death. A deployed Red Cross VSAT. Non-governmental organizations (NGOs) and humanitarian aid organizations are best positioned to respond quickly if they partner with organizations that can supplement needs and work out connectivity issues regardless of where the aid is deployed. ITC Global’s ongoing partnership with organizations such as NetHope and the Red Cross enable the company to engage with disaster relief and humanitarian aid organizations 24 hours a day, seven days a week — making an immediate and lasting impact rather than reactively working to organize a response following a disaster or crisis. Many of the NGO and charity organizations for which ITC Global delivers services are supported through NetHope. For instance, these services included free and discounted equipment and network solutions for extended use to multiple NetHope organizations throughout the recent African Ebola epidemic. At the peak of the crisis, ITC Global responded to requests for help by providing multiple NGO customers with much-needed technology in support of the first responders who were on the ground. ITC Global’s offerings included a VSAT trailer system and bandwidth throughout the epidemic. This helped make deployments possible, facilitated an expedited response and increased connectivity for those struggling to support the extreme nature of the situation. The free equipment and service was supported by ITC Global’s Network Operations Center (NOC) on an ongoing basis throughout the crisis. In addition to NetHope, ITC Global has provided critical communications to the Red Cross for more than seven years in support of their disaster relief efforts during responses to crises in numerous regions, including the Philippines, Sierra Leone, Nepal and Puerto Rico. 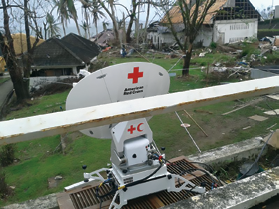 Due to the critical needs of many of the regions in which the Red Cross provides support, the organization needed a provider with the capability to supply always-on VSAT services to enable the disaster relief organization to quickly respond to emergencies and natural disasters around the world. ITC Global’s solutions and services provided the perfect match for the disaster relief organization with reliable internet, WiFi and voice capabilities. The company also provided the Red Cross with additional NOC support for critical VSAT setup outside the scope of typical disaster recovery communications support. 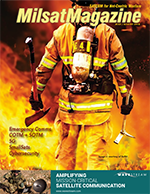 When ITC Global heard that the organization was in need of communications equipment for their ERU training in New Zealand, the team jumped into action. ITC Global’s Perth office and NOC team worked to coordinate the delivery of multiple satellite modems for the training, as well as test option files that were loaned to the New Zealand ERU. 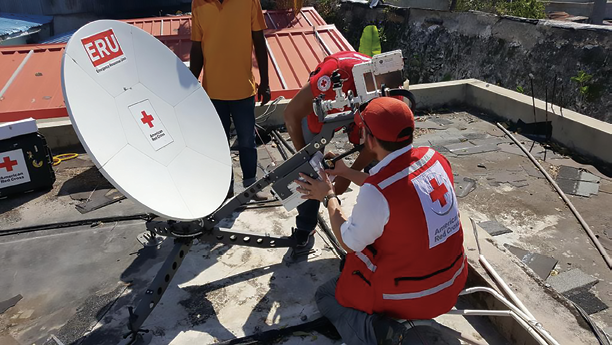 The added units, in addition to the Red Cross team’s VSAT modem, allowed the group to train with only three people per modem, greatly increasing the value of the training and providing extra hands-on experience that the group will need when deployed to a crisis. The ITC Global team provided extra support and worked with the ERU for several days, helping to create an ideal training environment for the Red Cross team and enabling them to troubleshoot and work through real-world field examples. ITC Global continues to maintain a long-standing partnership with the Red Cross and its ERU teams around the world. When it comes to providing services to NGOs and disaster relief organizations, providers should treat them the same way they treat their highest-priority customers. Emergency connectivity can make the difference in life or death situations, and companies such as ITC Global take pride in providing communications solutions that matter for people in need all over the world. As head of enterprise, Yagnesh Rajendran drives growth strategies across the global enterprise business and advances ITC Global’s delivery of complete connectivity solutions for mining, remote hospitality and NGO clients. Yagnesh leads all aspects of sales, account management and new business development for the company’s global enterprise business.